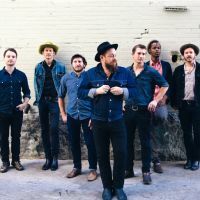 Nathaniel Rateliff & The Night Sweats in Montreal or Quebec City? Inform me about the next events for Nathaniel Rateliff & The Night Sweats. Enroll yourself to our priority waiting list for Nathaniel Rateliff & The Night Sweats to be alerted when new tickets are available. Filling this form doesn't engage you to any purchase. Nathaniel was born and raised in Missouri. He moved to Denver at the age of 18 to pursue missionary work. He started his solo career in 2005. The band Nathaniel Rateliff & The Night Sweats came together in 2013. Just before, Nathaniel recorded his second solo album, Falling Faster Than You Can, and went on tour to promote it with The Lumineers and Dr.Dog. Nathaniel Rateliff & The Night Sweats are coming to Impérial de Québec in November 2015 to promote their first, self-titled album.